In his youth, Jarrett Bay founder Randy Ramsey dreamed of running a fishing boat off the sometimes treacherous southern Outer Banks. He realized that dream taking out his first charter at age 18. 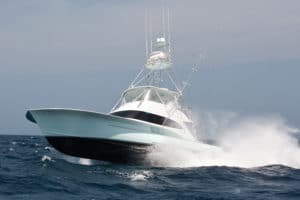 Since those early days, it has been nothing less than an unrelenting pursuit for Randy to build the perfect boat for himself and his family of Jarrett Bay owners. 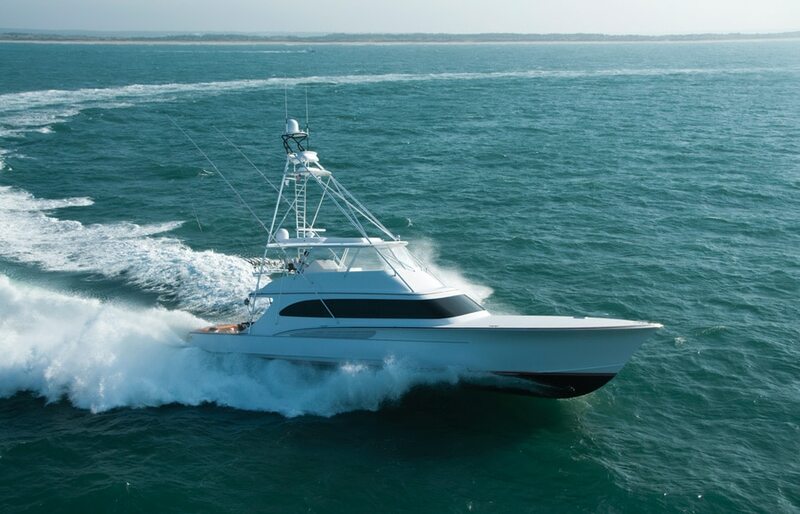 With such resolute intent, it should come as no surprise that your Jarrett Bay delivers the most confidence-inspiring offshore ride in the business. Upsea, the rake of the stem and the fine bow, narrower in beam than most, but fuller in cross-section, allows a Jarrett Bay to rise easily to oncoming waves, cleave through the crests and smooth a path through which the rest of the hull follows. Our light, but robust construction, minimizes accelerations—the sudden jolts felt as most boats come down off a wave. Downsea, gentle rocker incorporated into the chines, coupled with convexity worked into the ‘midships area keeps the bow up. This in tandem with a forefoot that’s deep enough to provide good tracking, yet balanced with the aft lifting surfaces, ensures straight tracking and a plunge-free run with the seas behind. Jarrett Bay’s low profile styling results not only in our sleek lines, but in a lower center of gravity (CG). Our lower CG gives the feeling from the helm of being at the center of all axes of the boat’s motion. You are one with it, not just riding it. The speeds that a Jarrett Bay is capable of requires particular attention to water flow. For example, our larger designs, those 60-feet and up, feature prop tunnels. These are canted inboard at their forward end, and are shaped so that the propeller blade tip clearance doesn’t change throughout their length. That means in a beam sea, or in a steep sea, you don’t experience cavitation that can cause a momentary loss of thrust. Our rudders, too, are optimized for high speeds, ensuring crisp handling. A Jarrett Bay boat never feels skittish, regardless of speed or sea state. In the tradition of Carolina custom construction, safety, durability, and the confidence that comes from both are built into your Jarrett Bay. Our method is an epoxy-composite process, generally referred to as cold molding. Materials selection is paramount. Your yacht’s bottom is sheathed in three layers of fir plywood, and the topsides with three layers of ¼” Okoume ply made from tropical hardwood. Fir is tough and impact resistant. Okoume’s ability to conform to sensuous curves and accept a high-grade finish is unequaled. Both are marine grade, meaning the veneers are glued with waterproof adhesive and there are no voids in the interior of the panels which can create hidden weaknesses. This “planking” is laid on to the mold forms and ribbands with a proprietary epoxy formula–epoxy being stronger than the wood itself once cured. The whole is sheathed in knitted fiberglass cloth, and also wet-out with epoxy. Knitted fabrics distribute stresses more equally and provide a superior resin-to-‘glass ratio than woven material. This method creates a stiff, lightweight structure that stands up to high-performance running for the long haul. We’re proud of the engineering and workmanship that goes into a Jarrett Bay. But we also know “rugged” means more than just a tough hull. That’s why our struts are backed with blocks that span a large section of the bilge, distributing stress against the event of striking flotsam. Our exhaust systems are secured to withstand the roughest seas. Bulkheads are scribed, cut, and installed to the absolute tightest tolerances, effectively compartmentalizing your yacht to contain the flow of water in the event of intrusion. The answer to why a Jarrett Bay is such an exceptional sea boat lies in the harmonious balance of all elements. The shapes on the running surface, the distribution of displacement, our excellent weight ratio, the low center of gravity and more. They are all related, play off one another, and play lesser or greater roles depending upon the speed at which you are running and the sea state you find yourself in at any given moment. Visit our facility and talk to us about our innovations, durability and safety. 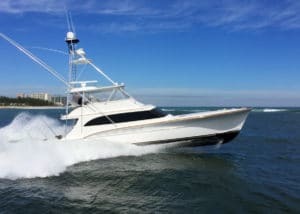 We invite you to see firsthand what makes a Jarrett Bay the most solidly seaworthy boat you can own.